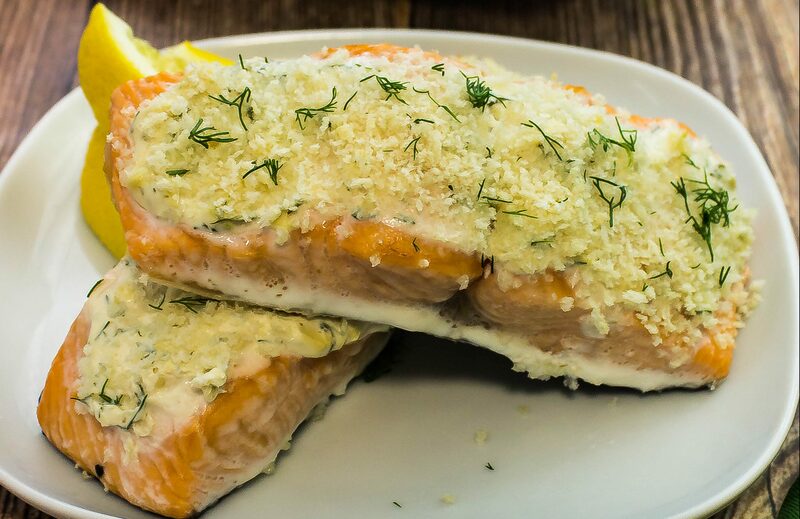 Lemon Dijon Crusted Salmon is dijon mustard, dill, & yogurt spread over salmon, topped with panko. 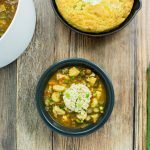 Quick to make & delicious! 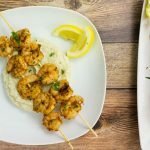 Weight Watchers friendly- 0 SmartPoints! One of my favorite fish to make at home is salmon. I like to get fresh salmon from the fish market at my grocery store and cook it that day. It just tastes so fresh and so healthy! My Lemon Dijon Crusted Salmon is great for a quick weeknight meal. 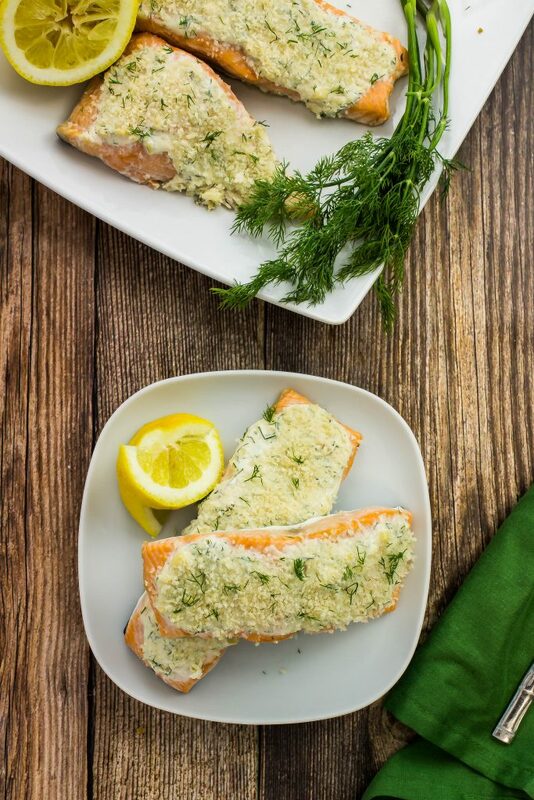 Dijon mustard, dill, and greek yogurt spread over salmon fillets, topped with panko and baked to perfection is fresh and decadent with every bite. This is a Weight Watchers friendly and one salmon filet is 0 SmartPoints. I’m always looking for different ways to jazz up salmon filets. Salmon is one of my favorite fish to make at home because it’s so easy to cook and there are so many different ways to change it up. A while back I made Bacon Honey Dijon Brussel Sprouts and I wanted to make another recipe using Dijon mustard. I really like Dijon mustard… it’s tangy and is creamier than regular mustard. It really tastes great mixed with olive oil to make a sauce or dressing. Salmon can be a bit bland without any spices, so for this recipe I wanted to create a delicious tangy sauce to go on top of the salmon. Rather than serve the sauce on the side, I decided to spread the sauce directly on top of the salmon while it bakes to really infuse the flavors into the salmon. This sauce is delicious and goes perfect with salmon! 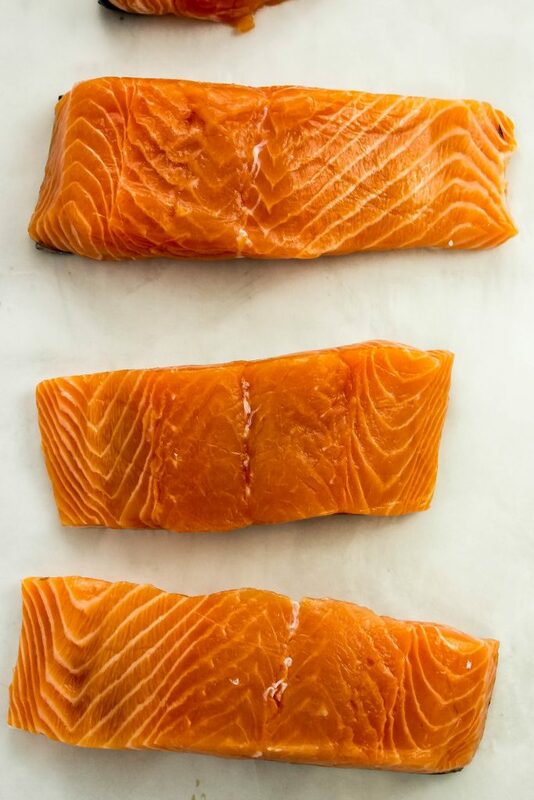 I prefer to use Wild Atlantic Salmon Filets, but you can use any type of salmon you can find fresh at your local grocery store. I always ask for them to cut the filets for me so that I don’t have to do it at home. 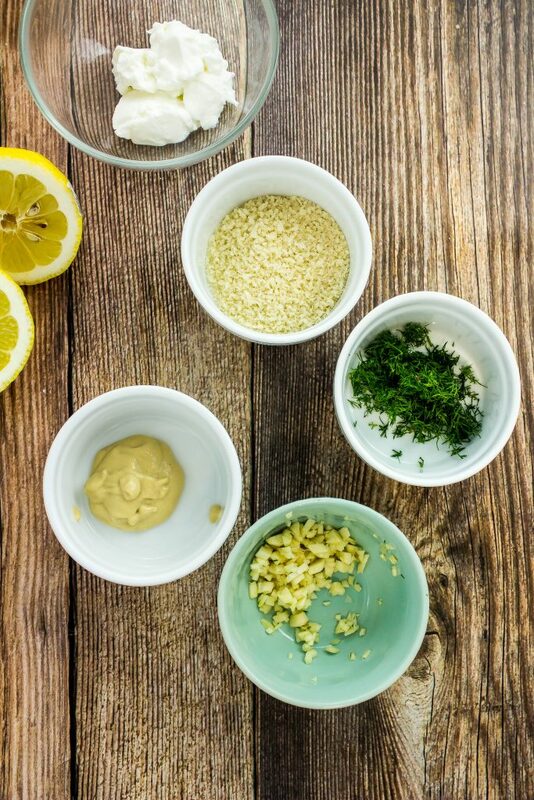 To get started, mix together greek yogurt, Dijon mustard, fresh dill, lemon, garlic, salt, and pepper. 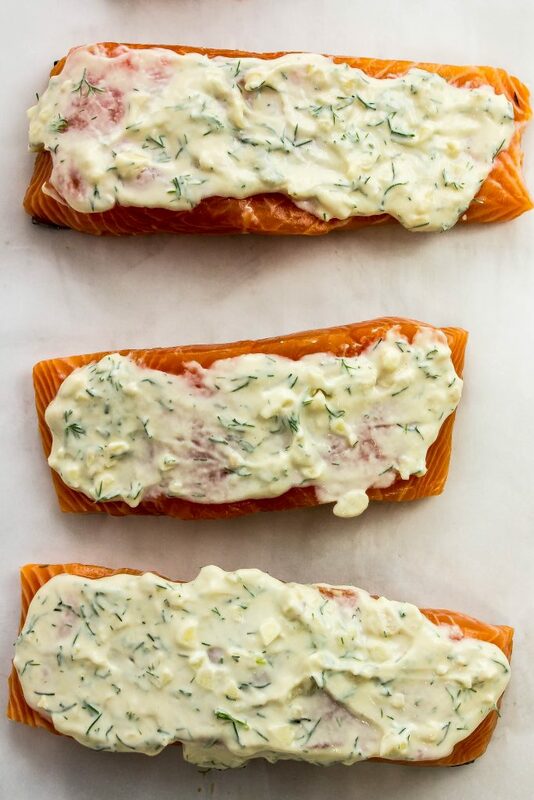 Spread the yogurt sauce on top of each salmon filet. Sprinkle the top of the salmon filets with panko bread crumbs. Bake at 425 degrees for 10 minutes and dinner is served! 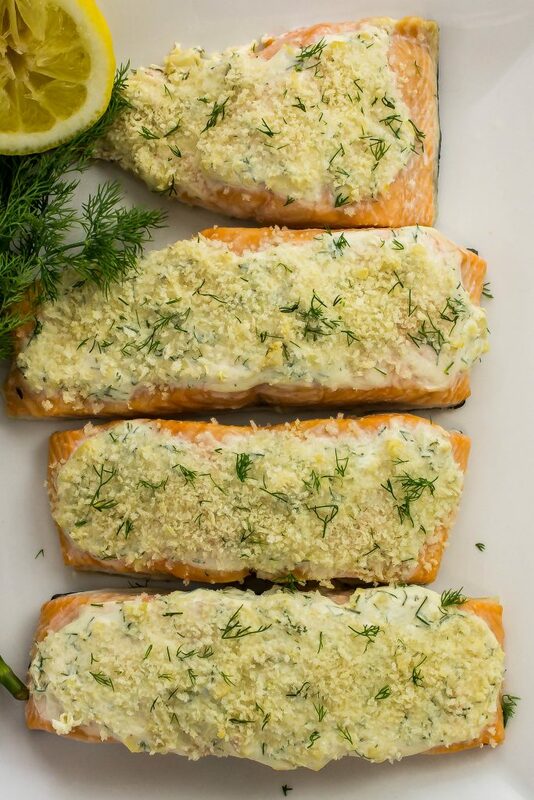 Lemon Dijon Crusted Salmon is fresh, healthy, and easy to make. 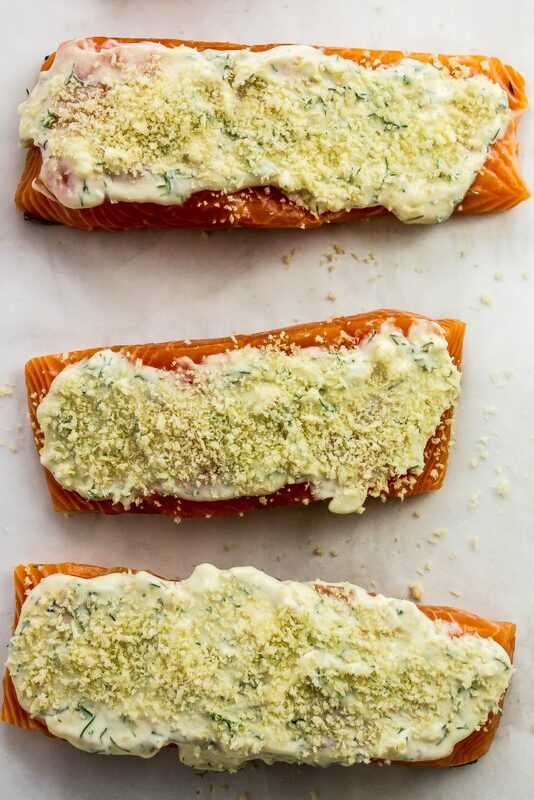 Dijon mustard, dill, and greek yogurt spread over salmon fillets, topped with panko and baked to perfection is fresh and decadent with every bite. Baked in less than 15 minutes for a quick weeknight meal! 0 Weight Watchers SmartPoints for one salmon filet! In small bowl, yogurt, mustard, dill, lemon juice, salt, pepper, and minced garlic. Season fillets with salt and pepper, spread yogurt sauce on top, then sprinkle top with breadcrumbs. 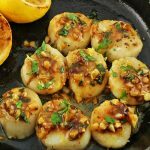 August 9, 2017 at 2:19 pm This looks so yummy! Your pictures are beautiful. Will have to try this one this week! August 10, 2017 at 10:48 am Thank you so much Amy :)! August 9, 2017 at 5:57 pm This sounds amazing! Salmon is my favorite fish and I love the idea of pairing lemon & Dijon with it! Thanks for sharing! 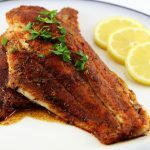 August 10, 2017 at 10:48 am The lemon and dijon are a great flavor to add to salmon! Thanks Gabby! August 9, 2017 at 6:25 pm I'm always so scared to cook my own salmon but this post helped to explain it to me! Thank you! August 9, 2017 at 9:45 pm omg i totally gotta make this before I go back to school! that looks absolutely yum! August 10, 2017 at 10:47 am I hope you like it!! August 10, 2017 at 10:47 am Thanks Jordyn! August 10, 2017 at 11:24 pm This looks delicious, I love all of those flavors! I like the use of greek yogurt instead of mayo or something more caloric! August 14, 2017 at 9:15 am Yes, I love to use greek yogurt in place too Sarah :)!